AUSTRALIA ― Southern California surfers and divers may be apprehensive about going in the ocean with all the shark sightings lately. Shark Mitigation Systems (SMS), a company located in Perth, Australia, hopes to quell such apprehension. The company claims to have designed a couple different wetsuits to help keep surfers and divers safe from shark attacks. Perth, a coastal city located on the west side of Australia, has experienced a number of fatal shark attacks. SMS was motivated to help reduce such fatalities. The company collaborated with University of Western Australia’s Ocean Institute to create a wetsuit to deter sharks from surfers and divers. Sharks rely on vision as well as other senses to pinpoint prey. “By disrupting a shark’s visual perception, an attack can either be diverted altogether or at least delayed to allow time to exit the water,” as stated on the website for Radiator, an Australian company selling the wetsuits. “The two design variations either present the wearer as potentially dangerous and unpalatable to a shark, or make it very difficult for the shark to see the wearer in the water,” Radiator’s website continued. 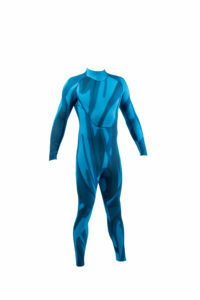 One wetsuit’s design includes different shades of blue to blend in with the water when diving. The other black and white design includes a wetsuit for surfers and stickers to be placed on a board. Sharks see surfers on boards as resembling prey such as seals. The pattern on the board and wetsuit breakup the solid looking mass, so the surfer does not appear to the shark as prey but rather something undesirable. Product “testing determined that on one of our key visual shark deterrent patterns, the chance of shark attack is reduced by 400 percent,” according to the SMS website. BoardLams.com, a Southern California company located in Costa Mesa, just partnered with SMS in July. The products are also available online at radiator.net.